The heist is over, and what a rousing success! 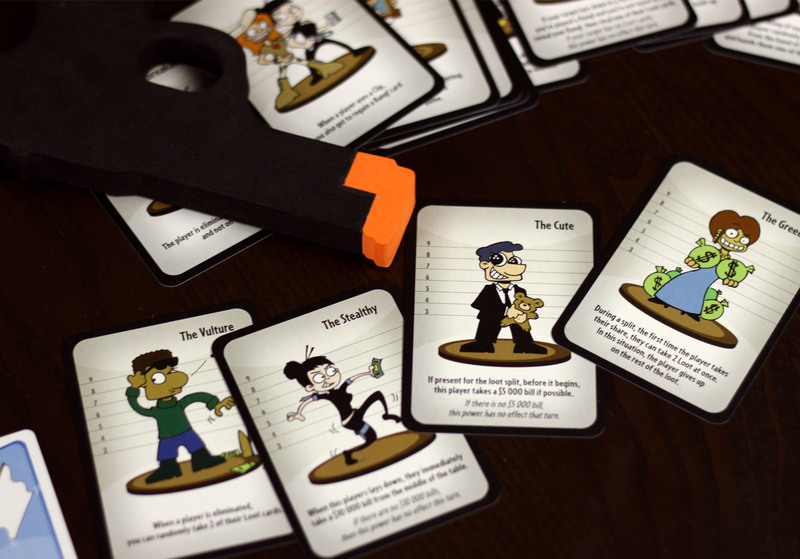 Your table is piled with cash and goods, and you and your mafia buddies are ready to celebrate! But wait… now that you’ve recovered the valuables, why should you share it with anyone else? You’ve got a gun. Time to take matters into your own hands. Unfortunately, everyone else seems to have had the same idea. The guns are loaded (or are they?) and the cash is hot. But who will come away as the baddest, richest gangster in town? It’s time to play Ca$h & Guns to find out. 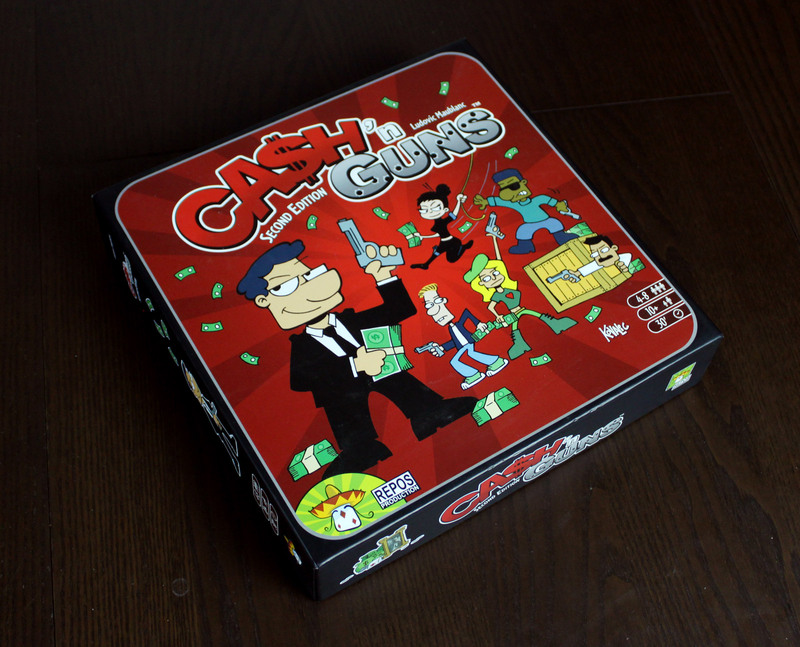 Ca$h & Guns is a zany, lighthearted party game all about trying to score the most money in the form of cash, diamonds, and valuable paintings, without getting killed. The cash is already on the table, so it’s all about bluffing and intimidating the other players into backing away to let you have your pick of the litter. Each round, there are 8 face-up cards with various rewards on them – most are cash in denominations of $5,000, $10,000 and $20,000. There are also paintings whose value increases dramatically the more you have, and diamonds, which range between $1,000 and $5,000 but award the player with the most diamonds collected a bonus $60,000 at the game’s end. In addition to prizes of monetary value, some cards give you extra bullets for your gun, and some offer healing from any wounds you’ve received. There is also the Godfather’s desk, which is available each round, and whoever claims it becomes Godfather in the next round. Everyone secretly chooses either a Bang! card or a Click! card from their hand (each player starts with 5 clicks and 3 bangs). 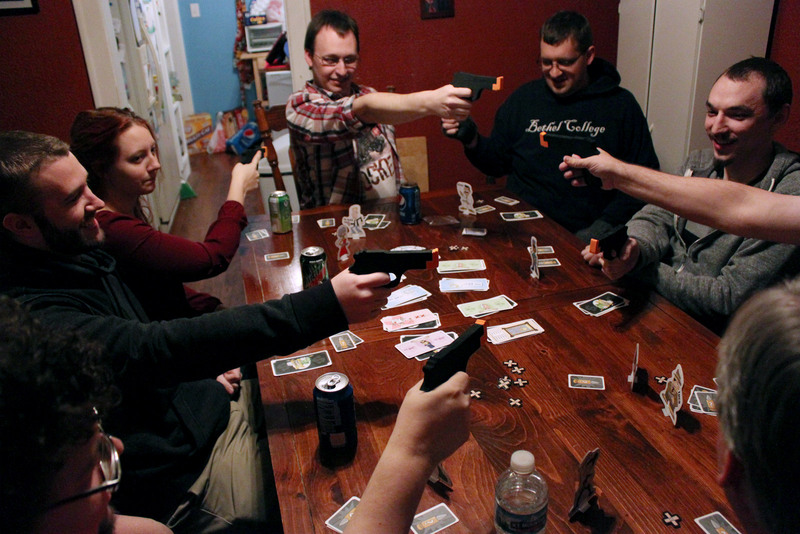 The Godfather counts 3… 2… 1… and then everyone must simultaneously choose another player and point their gun at them. Players must decide – if anyone is pointing a gun at them – if they want to stay in the round or not. After another count of 3… 2… 1… any player may knock over their character standee and lower their weapon to indicate they are backing out. Anyone who wants to stay in must shout Bonzai! Now we find out who gets shot. 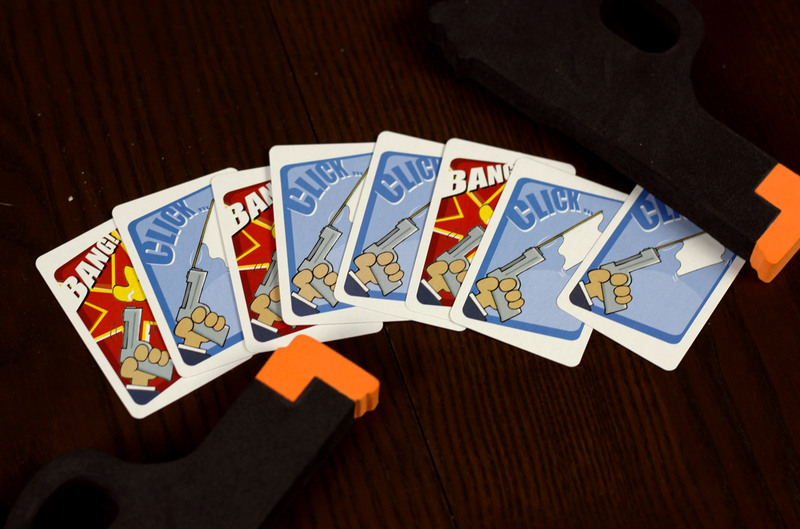 Anyone pointing a gun at someone still in the round reveals whether they played “Bang!” or “Click!” – only the “Bang!” cards actually wound the target. Firing blanks does nothing, ya know? The remaining players – who did not take a wound and did not back out of the round – get to divide the spoils between them. 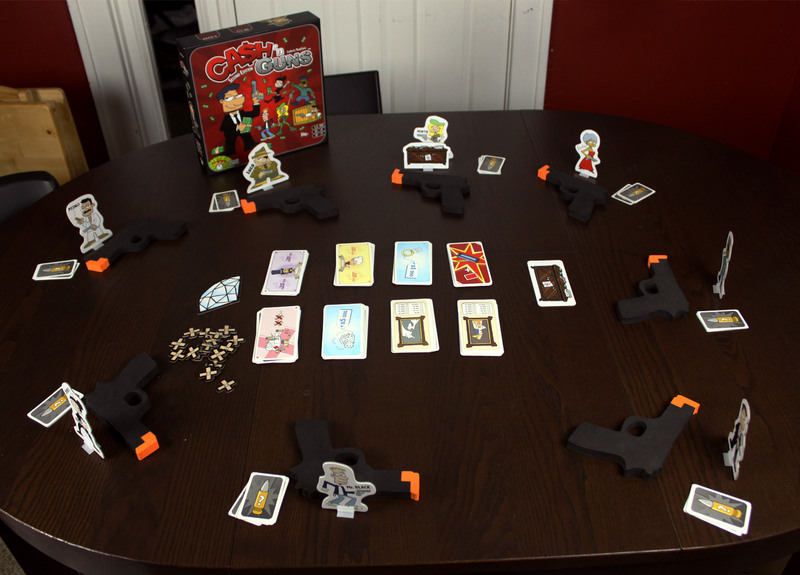 Starting with the Godfather and going clockwise around the circle, each player takes 1 card at a time (which often means the Godfather gets more cards than anyone else). Valuables are at stake! VALUABLES! If you take 3 wounds, you’re out of the game permanently. Anyone still alive at the end of 8 rounds totals up their cash – including the value of their paintings and diamonds (and the bonus for most number of diamond cards) and the player with the most cash wins! 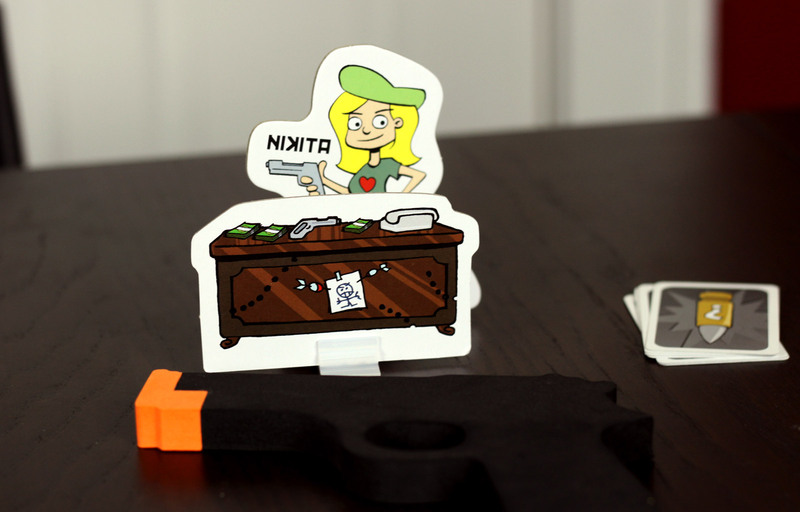 The box also includes a set of characters that have unique abilities, which can optionally be included. Run and Gun or Fun and Gun? Cash & Guns is a strange and unique game, in that it’s almost not a game at all. Strictly speaking, mechanically the game is unbalanced, unfair, and has no real strategy. The rules make very little way for players to achieve their goals. There is no leverage to lean on, no real way to make deals. You just point your gun and likely get shot. A whole cast of characters. Oddly there are only 3 female characters and 5 male. To put it succinctly, this game is kinda dumb. But that doesn’t stop me from enjoying it. This is a party game, not a strategy game. It’s meant to be dumb. The backstory is a bunch of criminals sitting around a table too dumb to just split the cash evenly and walk away. Instead, everyone pulls out a gun and starts shooting. When you accept the premise and just get into the game, you are rewarded with a stupid, silly, fun game that is perfect for big groups (up to 8 players) and especially those that include non-gamers. It’s not a “game” that requires strategy or experience, so anyone can play. It’s not a “performance” party game, so the shy people in the group can participate and have fun without feeling embarrassed or put on the spot. It’s not a trivia game that requires obscure knowledge to compete, and it’s certainly not an apples-to-apples style game that tends to punish the players most removed from the group. No, this is simply a game where you point a gun at the person you most think deserves to die – or at least, who you think shouldn’t get any money this time around. Nothing more is required, but plenty more is happening. The way to “win” if you are competitive is to try and keep the size of your pile of money out of the spotlight, while trying to subtly imply that Johnny or Sally or Alex has a hefty pile of doubloons from their last few scores. In a sense it’s a bluffing game or a negotiation game that works for people who neither like nor are good at bluffing or negotiation. You’re not hardlining deals or looking people in the eye trying to pretend your hand is worse than it is. It’s just Russian roulette – did you load the gun, or didn’t you? Chances are you didn’t, but it only takes one bullet to make a wound. No one can count cards, either, since a decent number of cards get discarded face down. Whenever you don’t actually get to pull the trigger, either because you dropped out of the round or your target did – you don’t reveal the bullet card you chose, which means it’s always up in the air whether you have another bullet or not. 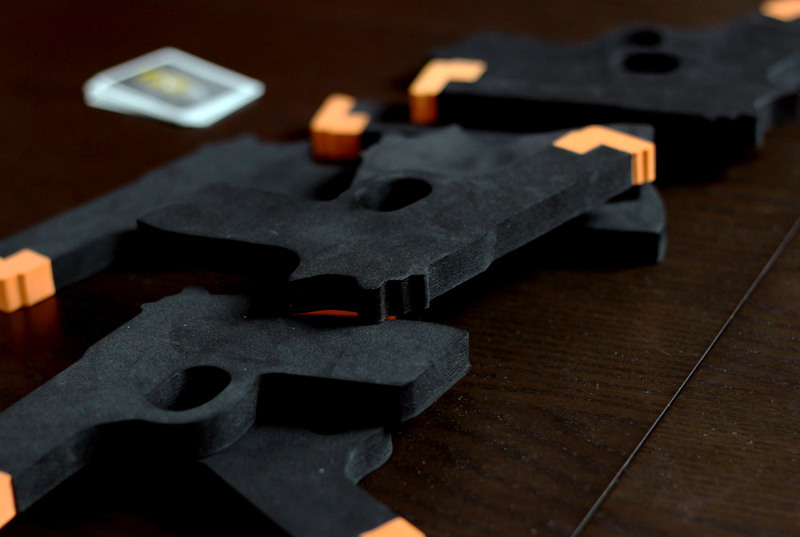 So, the very simple skills required – or not required, you could potentially scrape a win out of simply playing quiet and letting someone else point out who to shoot until they become a target themselves – and the silly nature of the game make for a simple, enjoyable experience. And it is funny. It’s funny to see 7 people all point a gun at the one guy who clearly has it out for him. It’s funny because that only happens once, and everybody laughs and moves on. It’s funny, because everyone’s just pointing these stupid foam guns at each other and it makes no sense but it feels JUST like one of those scenes in one of those movies where the bad guys and the good guys are all pointing guns at each other. You laugh and people get shot, or they don’t, you collect your cash and you move on. 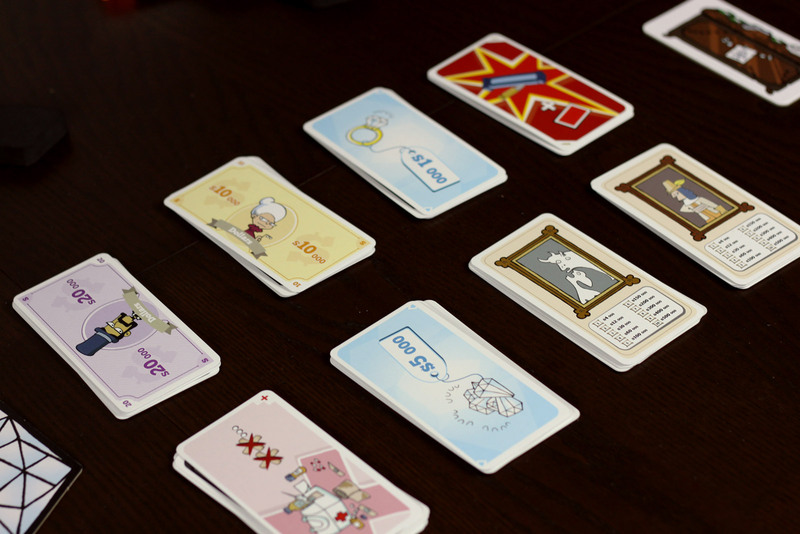 It all happens quickly, it’s lighthearted, and… well, it’s just a game. Yes, if you’re looking for a balanced, strategic experience you’ll have to look elsewhere. If you want tension, or long term strategy, or a big endgame payoff – such as in The Resistance – you’ll have to look elsewhere (such as The Resistance). If you just want to laugh and point guns at your friends because it’s stupid and fun and social, this is the right game. The components sell it, too. I never played the original edition, but I think John Kovalic’s art fits the style and humor of this game perfectly. The goofy spy movie/mafia/whatever stereotypes are all there and you can immediately see that yes, this game is silly. It’s not The Godfather – perhaps look at Nothing Personal for that – it’s more Get Smart. The guns are a great touch, and they’re nice and foamy and won’t hurt anyone but you can still hold on to them like a gun and pretend, but herein lies the game’s biggest detractor: you can’t get away from the fact that you are pointing gun-shaped objects at your friends. It doesn’t bother me, nor most of the people I play games with. But for younger kids – for whom this game would otherwise be perfectly accessible and fun – I could see a lot of parents who might have a lot of discomfort arming them, fake as the gun is, and telling them to pick someone to shoot at. Guns are a definitely a controversial sort of topic in the world today, and encouraging people to point them at other people for any reason is a bit touchy. As fake and silly as these toy guns are, there’s something inherently visceral even pretending to point a gun at an actual person. So you have to decide if that will bother you or your family. It’s probably not an “all-ages” sort of game, despite the cartoonish art and silly nature of the experience. For my gaming group, it’s a fun diversion, a fun way to switch it up from our normal, heavier gaming sessions. It’s another large-group game that’s quick and lite and fun. As long as you know you’re playing a silly, dumb, almost-pointless game, Ca$h & Guns is probably one of the most enjoyable silly, dumb, pointless games there is.